December (or as she is usually called, Ember) and Ness are the very best friends. Then Ness dies. Ember’s life has an empty hole. Ness was so alive and she should be alive. Ember decides she must rescue Ness. There will be consequences ... but surely a true friend must be prepared to pay the price? The myth of Orpheus and Eurydice resonates across the ages, expressing as it does the anger and frustration felt when faced by the death of someone very close. A. F. Harrold takes the myth and creates a narrative that is both relevant and immediate for a young audience. His Afterwards is a perfectly – and terrifying – imagined space. This is no colourful heaven, no gorgeous angels, rather we have a grey limbo (recalling, perhaps, the existence experienced by Greek heroes on death) where the dead may be pinned by the unrelenting backward looking memories of the living. It is a frightening image and this is not a cosy, comfortable read. 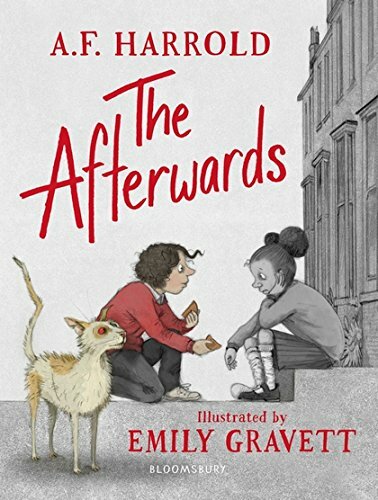 It is however a very satisfying one since Harrold has both imagined a very believable Afterwards that is consistent and logical as well as creating characters who step off the page, inviting the reader to share their feelings, to join them. Ember, in particular, is a very real girl whose actions and decisions are entirely believable; she is not a mere story-book heroine. Above all it is Harrold’s use of language that captures the atmosphere of his narrative. He is a poet, his words and his sense of style bring a conciseness, a sense of rhythm, a directness to the text that rings true encouraging the reader to the page and read on to the end. This is prose that can be read aloud as well as it can be read in the quiet of a personal space. Providing an ideal visual accompaniment are the illustrations and page decoration by Emily Gravett. Here we can see Ember, visualise the contrast between the two worlds epitomised by the reds worn by the living, feel the greyness. This is indeed a perfect pairing of two artists, one with words, the other with line. And weaving his way through it all is the cat. Those familiar with Harrold’s previous novels will recognise him – the catalyst, the companion and here perhaps the psychopomp.